Bangladesh Islami Chhatra Shibir has issued a statement condemning the incident involving sexual harassment and burning to death of madrasa female student Nusrat Jahan Rafi, a student of Sonagazi Islamia Fazil Madrasa in Feni district and demanded exemplary punishment for the culprits. 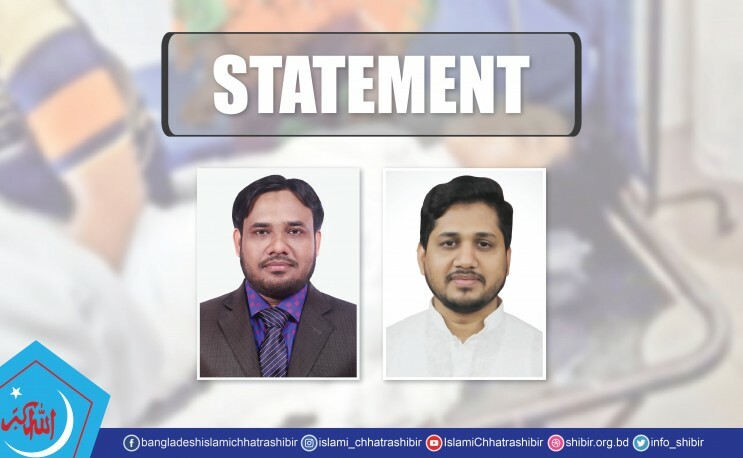 In a joint statement, Shibir Central President. Mubarak Hossain and Secretary General Sirajul Islam said, "We do not possess the language of condemning this brutality of sexual harassment followed by the burning a brilliant girl in front of the eyes of the nation. This cruelty is unacceptable. It can not be a picture of any civilized human society. This ruthless murder has brought down a blanket of mourning throughout the country. The leaders said that students and their guardians were very worried and alarmed after the incident. If a student is not safe in her own education institution, then where will she go? We hope that the trial process will not be limited to the arrest or punishment-for-show of the people involved. Harsh punishment of this brutality should be ensured such that such incidents are never repeated. No parent is ready to listen to accounts of sexual harassment of their own child, or to look at their burned body. We demand exemplary punishment of the culprits and the speeding up of the trial process. Along with this, we urge the government to take effective measures to ensure the overall safety of the students in every educational institution. At the same time, we want to announce that Chhatra Shibir is beside the family of the murdered student. The student community will not tolerate any repetition of injustice. We pray to Allah the Almighty that He grant our oppressed sister Nusrat Jahan Rafi the highest place in Jannah.